Chickenpox, also known as varicella, is a highly contagious disease caused by the initial infection with varicella zoster virus (VZV). The disease results in a characteristic skin rash that forms small, itchy blisters, which eventually scab over. It usually starts on the chest, back, and face then spreads to the rest of the body. Other symptoms may include fever, feeling tired, and headaches. Symptoms usually last five to ten days. Complications may occasionally include pneumonia, inflammation of the brain, or bacterial infections of the skin among others. The disease is often more severe in adults than children. Symptoms begin ten to twenty-one days after exposure to the virus. Chickenpox is an airborne disease which spreads easily through the coughs and sneezes of an infected person. It may be spread from one to two days before the rash appears until all lesions have crusted over. It may also spread through contact with the blisters. Those with shingles may spread chickenpox to those who are not immune through contact with the blisters. The disease can usually be diagnosed based on the presenting symptom; however, in unusual cases may be confirmed by polymerase chain reaction (PCR) testing of the blister fluid or scabs. Testing for antibodies may be done to determine if a person is or is not immune. People usually only get the disease once. Although reinfections by the virus occur, these reinfections usually do not cause any symptoms. The varicella vaccine has resulted in a decrease in the number of cases and complications from the disease. It protects about 70 to 90 percent of people from disease with a greater benefit for severe disease. Routine immunization of children is recommended in many countries. Immunization within three days of exposure may improve outcomes in children. Treatment of those infected may include calamine lotion to help with itching, keeping the fingernails short to decrease injury from scratching, and the use of paracetamol (acetaminophen) to help with fevers. For those at increased risk of complications antiviral medication such as aciclovir are recommended. Chickenpox occurs in all parts of the world. As of 2013 140 million cases of chickenpox and herpes zoster occurred. Before routine immunization the number of cases occurring each year was similar to the number of people born. Since immunization the number of infections in the United States has decreased nearly 90%. In 2013 chickenpox resulted in 7,000 deaths globally – down from 8,900 in 1990. Death occurs in about 1 per 60,000 cases. Chickenpox was not separated from smallpox until the late 19th century. In 1888 its connection to shingles was determined. The first documented use of the term chicken pox was in 1658. Various explanations have been suggested for the use of "chicken" in the name, one being the relative mildness of the disease. Because watery nasal discharge containing live virus usually precedes both exanthem (external rash) and enanthem (oral ulcers) by 1 to 2 days, the infected person actually becomes contagious one to two days before recognition of the disease. Contagiousness persists until all vesicular lesions have become dry crusts (scabs), which usually entails four or five days, by which time nasal shedding of live virus ceases. The condition usually resolves by itself within a couple of weeks. 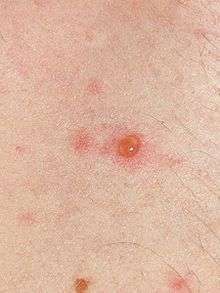 The rash may, however, last for up to one month, although the infectious stage does not last longer than a week or two. A child with chickenpox at an orphanage. During pregnancy the dangers to the fetus associated with a primary VZV infection are greater in the first six months. In the third trimester, the mother is more likely to have severe symptoms. For pregnant women, antibodies produced as a result of immunization or previous infection are transferred via the placenta to the fetus. Women who are immune to chickenpox cannot become infected and do not need to be concerned about it for themselves or their infant during pregnancy. The diagnosis of chickenpox is primarily based on the signs and symptom, with typical early symptoms followed by a characteristic rash. Confirmation of the diagnosis is by examination of the fluid within the vesicles of the rash, or by testing blood for evidence of an acute immunologic response. Vesicular fluid can be examined with a Tzanck smear, or better by testing for direct fluorescent antibody. The fluid can also be "cultured", whereby attempts are made to grow the virus from a fluid sample. Blood tests can be used to identify a response to acute infection (IgM) or previous infection and subsequent immunity (IgG). After a chickenpox infection, the virus remains dormant in the body's nerve tissues. The immune system keeps the virus at bay, but later in life, usually in an adult, it can be reactivated and cause a different form of the viral infection called shingles (also known as herpes zoster). The United States Advisory Committee on Immunization Practices (ACIP) suggests that every adult over the age of 60 years get the herpes zoster vaccine. The varicella vaccine is recommended in many countries. Some countries require the varicella vaccination or an exemption before entering elementary school. A second dose is recommended five years after the initial immunization. A vaccinated person is likely to have a milder case of chickenpox if they become infected. Immunization within three days of exposure may improve outcomes in children. It is part of the routine immunization schedule in the US. Some European countries include it as part of universal vaccinations in children, but not all countries provide the vaccine due to its cost. In the UK as of 2014, the vaccine is only recommended in people who are particularly vulnerable to chickenpox. In populations that have not been immunized or if immunity is questionable, a clinician may order an Enzyme immunoassay. An immunoessay measures the levels of antibodies against the virus that give immunity to a person. If the levels of antibodies are low (low titer) or questionable, reimmuization may be done. Infection in otherwise healthy adults tends to be more severe. Treatment with antiviral drugs (e.g. acyclovir or valacyclovir) is generally advised, as long as it is started within 24–48 hours from rash onset. Remedies to ease the symptoms of chickenpox in adults are basically the same as those used for children. Adults are more often prescribed antiviral medication, as it is effective in reducing the severity of the condition and the likelihood of developing complications. Antiviral medicines do not kill the virus but stop it from multiplying. Adults are advised to increase water intake to reduce dehydration and to relieve headaches. Painkillers such as paracetamol (acetaminophen) are recommended, as they are effective in relieving itching and other symptoms such as fever or pains. Antihistamines relieve itching and may be used in cases where the itching prevents sleep, because they also act as a sedative. As with children, antiviral medication is considered more useful for those adults who are more prone to develop complications. These include pregnant women or people who have a weakened immune system. Sorivudine, a nucleoside analogue, has been reported to be effective in the treatment of primary varicella in healthy adults (case reports only), but large-scale clinical trials are still needed to demonstrate its efficacy. After recovering from chickenpox, it is recommended by doctors that adults take one injection of VZV immune globulin and one injection of varicella vaccine or herpes zoster vaccine. The duration of the visible blistering caused by varicella zoster virus varies in children usually from 4 to 7 days, and the appearance of new blisters begins to subside after the fifth day. Chickenpox infection is milder in young children, and symptomatic treatment, with sodium bicarbonate baths or antihistamine medication may ease itching. It is recommended to keep new infants from birth up to age 6 months away from an infected person for 10 to 21 days because their immune systems are not developed enough to handle the stress it can bring on. Paracetamol (acetaminophen) is widely used to reduce fever. Aspirin, or products containing aspirin, should not be given to children with chickenpox, as it can cause Reye's Syndrome. Primary varicella occurs in all countries worldwide. In 2013 the disease resulted in 7,000 deaths – down from 8,900 in 1990. Why the term was used is not clear but it may be due to it being a relatively mild disease. It has been said to be derived from chickpeas, based on resemblance of the vesicles to chickpeas, or to come from the rash resembling chicken pecks. Other suggestions include the designation chicken for a child (i.e., literally 'child pox'), a corruption of itching-pox, or the idea that the disease may have originated in chickens. Samuel Johnson explained the designation as "from its being of no very great danger." Because chickenpox is usually more severe in adults than it is in children, some parents deliberately expose their children to the virus, sometimes by taking them to "chickenpox parties." Doctors counter that children are safer getting the vaccine, which is a weakened form of the virus, rather than getting the disease, which can be fatal. Humans are the only known animal that the disease affects naturally. However, chickenpox has been caused in other primates, including chimpanzees and gorillas. 1 2 3 4 "Chickenpox (Varicella) Signs & Symptoms". Centers for Disease Control and Prevention (cdc.gov). November 16, 2011. Retrieved 4 February 2015. 1 2 3 4 5 6 7 8 9 10 11 Atkinson, William (2011). Epidemiology and Prevention of Vaccine-Preventable Diseases (12 ed.). Public Health Foundation. pp. 301–323. ISBN 9780983263135. Retrieved 4 February 2015. 1 2 3 4 5 6 7 8 "Chickenpox (Varicella) Prevention & Treatment". cdc.gov. November 16, 2011. Retrieved 4 February 2015. 1 2 3 Flatt, A; Breuer, J (September 2012). "Varicella vaccines.". British medical bulletin. 103 (1): 115–27. doi:10.1093/bmb/lds019. PMID 22859715. 1 2 Macartney, K; Heywood, A; McIntyre, P (23 June 2014). "Vaccines for post-exposure prophylaxis against varicella (chickenpox) in children and adults.". The Cochrane database of systematic reviews. 6: CD001833. doi:10.1002/14651858.CD001833.pub3. PMID 24954057. 1 2 3 4 Oxford University Press (December 2014). "chickenpox, n.". oed.com. Retrieved February 4, 2015. 1 2 Anthony J Papadopoulos. Dirk M Elston, ed. "Chickenpox Clinical Presentation". Medscape Reference. Retrieved 4 August 2012. ↑ "Chickenpox (varicella)". Retrieved 6 November 2010. ↑ Askalan R, Laughlin S, Mayank S, Chan A, MacGregor D, Andrew M, Curtis R, Meaney B, deVeber G (June 2001). "Chickenpox and stroke in childhood: a study of frequency and causation". Stroke. 32 (6): 1257–62. doi:10.1161/01.STR.32.6.1257. PMID 11387484. ↑ Heuchan AM, Isaacs D (19 March 2001). "The management of varicella-zoster virus exposure and infection in pregnancy and the newborn period. Australasian Subgroup in Paediatric Infectious Diseases of the Australasian Society for Infectious Diseases.". The Medical journal of Australia. 174 (6): 288–92. PMID 11297117. ↑ Brannon, Heather (22 July 2007). "Chickenpox in Pregnanc". Dermatology. About.com. Retrieved 20 June 2009. ↑ "Chickenpox During Pregnancy". March of Dimes. November 11, 2014. ↑ Boussault P, Boralevi F, Labbe L, Sarlangue J, Taïeb A, Leaute-Labreze C (2007). "Chronic varicella-zoster skin infection complicating the congenital varicella syndrome". Pediatr Dermatol. 24 (4): 429–32. doi:10.1111/j.1525-1470.2007.00471.x. PMID 17845179. ↑ Matsuo T, Koyama M, Matsuo N (July 1990). "Acute retinal necrosis as a novel complication of chickenpox in adults". Br J Ophthalmol. 74 (7): 443–4. doi:10.1136/bjo.74.7.443. PMC 1042160 . PMID 2378860. ↑ Mazzella M, Arioni C, Bellini C, Allegri AE, Savioli C, Serra G (2003). "Severe hydrocephalus associated with congenital varicella syndrome". Canadian Medical Association Journal. 168 (5): 561–563. PMC 149248 . PMID 12615748. ↑ Sauerbrei A, Wutzler P (December 2001). "Neonatal varicella". J Perinatol. 21 (8): 545–9. doi:10.1038/sj.jp.7210599. PMID 11774017. 1 2 3 Royal College of Obstetricians and Gynaecologists (September 2007). "Chickenpox in Pregnancy" (PDF). Retrieved 22 July 2009. ↑ Pincus, Matthew R.; McPherson, Richard A.; Henry, John Bernard (2007). "Ch. 54". Henry's clinical diagnosis and management by laboratory methods (21st ed.). Saunders Elsevier. ISBN 1-4160-0287-1. ↑ Kanbayashi Y, Onishi K, Fukazawa K, Okamoto K, Ueno H, Takagi T, Hosokawa T (2012). "Predictive Factors for Postherpetic Neuralgia Using Ordered Logistic Regression Analysis". The Clinical Journal of Pain. 28 (8): 712–714. doi:10.1097/AJP.0b013e318243ee01. PMID 22209800. ↑ Pino Rivero V, González Palomino A, Pantoja Hernández CG, Mora Santos ME, Trinidad Ramos G, Blasco Huelva A (2006). "Ramsay-Hunt syndrome associated to unilateral recurrential paralysis". Anales otorrinolaringologicos ibero-americanos. 33 (5): 489–494. PMID 17091862. ↑ "The varicella zoster virus vasculopathies: clinical, CSF, imaging, and virologic features.". Neurology. March 2008. ↑ "Chickenpox". NHS Choices. UK Department of Health. 19 April 2012. ↑ "An Overview of Shingles". WebMD. ↑ Murray, Patrick R.; Rosenthal, Ken S.; Pfaller, Michael A. (2005). Medical Microbiology (5th ed.). Elsevier Mosby. p. 551. ISBN 0-323-03303-2. , edition (Elsevier), p.
↑ Chaves SS, Gargiullo P, Zhang JX, Civen R, Guris D, Mascola L, Seward JF (2007). "Loss of vaccine-induced immunity to varicella over time". N Engl J Med. 356 (11): 1121–9. doi:10.1056/NEJMoa064040. PMID 17360990. ↑ "Chickenpox (varicella) vaccination". NHS Choices. UK Department of Health. 19 April 2012. ↑ "Child, Adolescent & "Catch-up" Immunization Schedules". Immunization Schedules. Centers for Disease Control and Prevention. ↑ Carrillo-Santisteve, P; Lopalco, PL (May 2014). "Varicella vaccination: a laboured take-off.". Clinical Microbiology and Infection. 20 Suppl 5: 86–91. doi:10.1111/1469-0691.12580. PMID 24494784. ↑ "Why aren't children in the UK vaccinated against chickenpox?". NHS Choices. UK National Health Service. Retrieved 10 June 2015. ↑ Leeuwen, Anne (2015). Davis's comprehensive handbook of laboratory & diagnostic tests with nursing implications. Philadelphia: F.A. Davis Company. p. 1579. ISBN 9780803644052. ↑ Tebruegge M, Kuruvilla M, Margarson I (2006). "Does the use of calamine or antihistamine provide symptomatic relief from pruritus in children with varicella zoster infection?" (Abstract). Arch. Dis. Child. 91 (12): 1035–6. doi:10.1136/adc.2006.105114. PMC 2082986 . PMID 17119083. ↑ Brannon, Heather (21 May 2008). Chicken Pox Treatments. About.com. ↑ Parmet S, Lynm C, Glass RM (February 2004). "JAMA patient page. Chickenpox". JAMA. 291 (7): 906. doi:10.1001/jama.291.7.906. PMID 14970070. ↑ Naus M; et al. (15 October 2006). "Varizig™ as the Varicella Zoster Immune Globulin for the Prevention of Varicella In At-Risk Patients". Canada Communicable Disease Report. 32 (ACS-8). ↑ Huff JC (January 1988). "Antiviral treatment in chickenpox and herpes zoster.". Journal of the American Academy of Dermatology. 18 (1 Pt 2): 204–6. doi:10.1016/S0190-9622(88)70029-8. PMID 3339143. ↑ Gnann Jr, John W. (2007). "Chapter 65Antiviral therapy of varicella-zoster virus infections". In Arvin, Ann; et al. Human herpesviruses : biology, therapy, and immunoprophylaxis. Cambridge: Cambridge University Press. ISBN 978-0-521-82714-0. Retrieved 20 January 2014. ↑ Kay, A. B. (2001). "Allergy and allergic diseases. First of two parts". The New England Journal of Medicine. 344 (1): 30–7. doi:10.1056/NEJM200101043440106. PMID 11136958. ↑ Kay, A. B. (2001). "Allergy and allergic diseases. Second of two parts". The New England Journal of Medicine. 344 (2): 109–13. doi:10.1056/NEJM200101113440206. PMID 11150362. 1 2 "Antiviral medications for chickenpox". Retrieved 27 March 2011. ↑ "Chickenpox in Children Under 12". Retrieved 6 November 2010. ↑ "Reye's Syndrome-Topic Overview". Retrieved 27 March 2011. ↑ Tunbridge AJ, Breuer J, Jeffery KJ (August 2008). "Chickenpox in adults - clinical management". The Journal of Infection. 57 (2): 95–102. doi:10.1016/j.jinf.2008.03.004. PMID 18555533. ↑ "What is chickenpox?". Retrieved 6 November 2010. ↑ Somekh E, Dalal I, Shohat T, Ginsberg GM, Romano O (2002). "The burden of uncomplicated cases of chickenpox in Israel". J. Infect. 45 (1): 54–7. doi:10.1053/jinf.2002.0977. PMID 12217733. ↑ US Centers for Disease Control and Prevention. "Varicella Treatment Questions & Answers". CDC Guidelines. CDC. Retrieved 23 August 2007. ↑ Baren JM, Henneman PL, Lewis RJ (August 1996). "Primary Varicella in Adults: Pneumonia, Pregnancy, and Hospital Admissions". Annals of Emergency Medicine. 28 (2): 165–169. doi:10.1016/S0196-0644(96)70057-4. PMID 8759580. 1 2 Mohsen AH, McKendrick M (May 2003). "Varicella pneumonia in adults". Eur. Respir. J. 21 (5): 886–91. doi:10.1183/09031936.03.00103202. PMID 12765439. ↑ Anderson, D.R. ; Schwartz, J.; Hunter, N.J.; Cottrill, C.; Bissaccia, E.; Klainer, A.S. (1994). "Varicella Hepatitis: A Fatal Case in a Previously Healthy, Immunocompetent Adult". Archives of Internal Medicine. JAMA. 154 (18): 2101–2106. doi:10.1001/archinte.1994.00420180111013. PMID 8092915. ↑ Abro AH, Ustadi AM, Das K, Abdou AM, Hussaini HS, Chandra FS (December 2009). "Chickenpox: presentation and complications in adults". Journal of Pakistan Medical Association. 59 (12): 828–831. PMID 20201174. Retrieved 17 April 2013. ↑ "Definition of Chickenpox". MedicineNet.com. Retrieved 18 August 2006. ↑ "Is Necrotizing Fasciitis a complication of Chickenpox of Cutaneous Vasculitis?". atmedstu.com. Retrieved 18 January 2008. ↑ Strangfeld A, Listing J, Herzer P, Liebhaber A, Rockwitz K, Richter C, Zink A (February 2009). "Risk of herpes zoster in patients with rheumatoid arthritis treated with anti-TNF-alpha agents". JAMA. 301 (7): 737–44. doi:10.1001/jama.2009.146. PMID 19224750. ↑ Weller TH (1997). "Varicella-herpes zoster virus". In Evans AS, Kaslow RA. Viral Infections of Humans: Epidemiology and Control. Plenum Press. pp. 865–92. ISBN 978-0-306-44855-3. ↑ Wharton M (1996). "The epidemiology of varicella-zoster virus infections". Infect Dis Clin North Am. 10 (3): 571–81. doi:10.1016/S0891-5520(05)70313-5. PMID 8856352. ↑ "Epidemiology of Varicella Zoster Virus Infection, Epidemiology of VZV Infection, Epidemiology of Chicken Pox, Epidemiology of Shingles". Retrieved 22 April 2008. ↑ "Georgia ranks 10th for social media admissions of chickenpox". Retrieved 13 June 2013. ↑ "Chickenpox in the USA". Retrieved 12 June 2013. 1 2 Belshe, Robert B. (1984). Textbook of human virology (2nd ed.). Littleton MA: PSG. p. 829. ISBN 0-88416-458-6. 1 2 Teri Shors (2011). "Herpesviruses: Varicella Zoster Virus (VZV)". Understanding Viruses (2nd ed.). Jones & Bartlett. p. 459. ISBN 978-0-7637-8553-6. ↑ Pattison, John; Zuckerman, Arie J.; Banatvala, J.E. (1994). Principles and practice of clinical virology (3rd ed.). Wiley. p. 37. ISBN 0-471-93106-3. ↑ Johnson, Samuel (1839). Dictionary of the English language. London: Williamson. p. 195. ↑ Cohen JI, Moskal T, Shapiro M, Purcell RH (December 1996). "Varicella in Chimpanzees". Journal of Medical Virology. 50 (4): 289–92. doi:10.1002/(SICI)1096-9071(199612)50:4<289::AID-JMV2>3.0.CO;2-4. PMID 8950684. ↑ Myers MG, Kramer LW, Stanberry LR (December 1987). "Varicella in a gorilla". Journal of Medical Virology. 23 (4): 317–22. doi:10.1002/jmv.1890230403. PMID 2826674. "Management of Varicella Zoster Virus (VZV) Infections" (PDF). Federal Bureau of Prisons: Clinical Practice Guideline. December 2011. Retrieved 18 May 2013. Sarah McSweeney-Ryan; Megan Sandel. "The Health Care of Homeless Persons - Part I - Varicella (Chickenpox" (PDF). Boston Health Care for the Homeless Program. Retrieved 18 May 2013.